Yesterday, I hosted Don Puckett from Katy Texas, who came down to video me while I tied the VIP Popper and Mother's Day Fly. I will be posting the Vimeo links just as soon as he edits the video. Don arrived around noon, so we proceeded to do the video, and then took off for some evening flyfishing. I took Don directly to the venue where I'd caught a 30-inch red last Saturday, and could have caught several more. We entered the area much earlier than the previous week--about 3:00 instead of 4:30. I fully expected to take a look, and find nothing, in which I would go elsewhere for a couple of hours and then return for the hoped-for evening action. But we hadn't gone far before I saw single gulls working close to the water, signifying feeding redfish. So I staked the Stilt inconveniently downwind of the action, and we proceeded to wade upwind to the working birds. It wasn't long before some of the reds that were sweeping around headed our way. Casting a red VIP to three or four wakes that were clearly visible under a single gull, one of the fish grabbed the fly and shot off. It didn't take me long to realize that the fish was at least 30 inches long, perhaps as much as 32 inches. It created quite a commotion blowing up and ripping through the shallow water. I had fought him for about five minutes, and he really hadn't turned yet. Fortunately, he stayed in the area, and then unfortunately he headed straight for me while he was still clearly "green" and far from ready to come to the hand. I waved my free arm, and kicked the water with my booties, hoping the fish would turn, but alas he sped up and shot a foot past my right leg. The line whipped under my arm, and pow! The tippet parted at the blood knot connection! 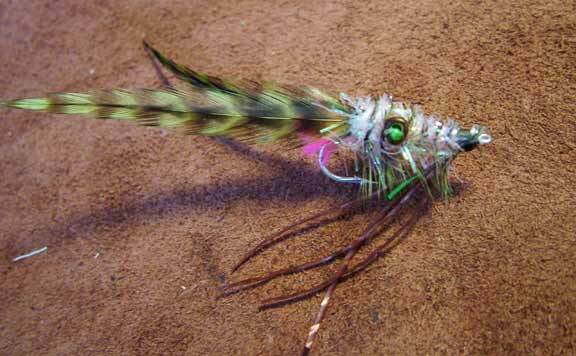 I replaced my fly with a Mother's Day fly, and turned back to the fish that were sweeping upwind. Within a few minutes, another pair of big reds swam by me about 40 feet crosswind. I managed to get the MDF to the lead fish, which came out of the water and hit it explosively. I landed that fish, and it was 28-29 inches. Don and I did not land any more fish, but we both had several more shots. The conditions were difficult--windy and casting upwind, murky water, and oversized, wary fish. It was easy to blow them up or miss the cast. Nonetheless, it was a spectacle we'll never forget. Don was happy just to see the number of large reds in such shallow conditions. It was a windy Saturday, and my partner Randy had had his trip canceled because his clients were afraid of the wind. Rosie and I went out about 4:30 to do one of our favorite things, which is to fish on the sand, and/or in one of our favorite westside lagoons. I ducked into the lagoon since it was on the way more or less, and I saw some single gulls working in very shallow water. So Rosie and I got out of the boat and walked over close to where the birds were tracking up wind, obviously following single reds or small groups in about 7 inches of water. Even though the wind was blowing 25 miles an hour, and the water was completely muddy, I knew I could see them coming upwind. The problem is always getting the fly close enough to where they can see it, but far enough away from them to where they don’t spook--almost an impossible compromise, but the fish are incredibly sensitive in this condition, and will sometimes sense the fly from three feet away. The reds coming in to this area late in the evening, tend to be very large, often oversized. So they are wary, and especially smart. I had shots at probably eight or 10 fish, some of which would appear 80 or 90 yards out under a single bird, giving me a chance to get into place for the cast. But between the wind being so strong, and the fish so wary, I blew up every opportunity. In addition to seeing the fish coming upwind under a bird or two, I would occasionally see a back out the water 10 or 15 feet away from me, cruising by. It was very hard to cast to these fish that were so close to us. But I didn’t get frustrated, because I’ve caught so many reds in the past, I don't need much to satisfy me: I just enjoy being out there. So after while, I decided to head toward the Eastside and check out the sand, where the reds often pour into the shallowest water before sunset. 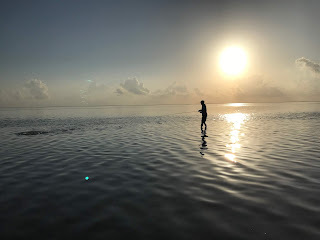 But after getting up, and before I had left the westside lagoon, I saw some birds working along another shoreline, so I ran over and stopped, and got out and walked over to where the birds were frenetically working over fish. 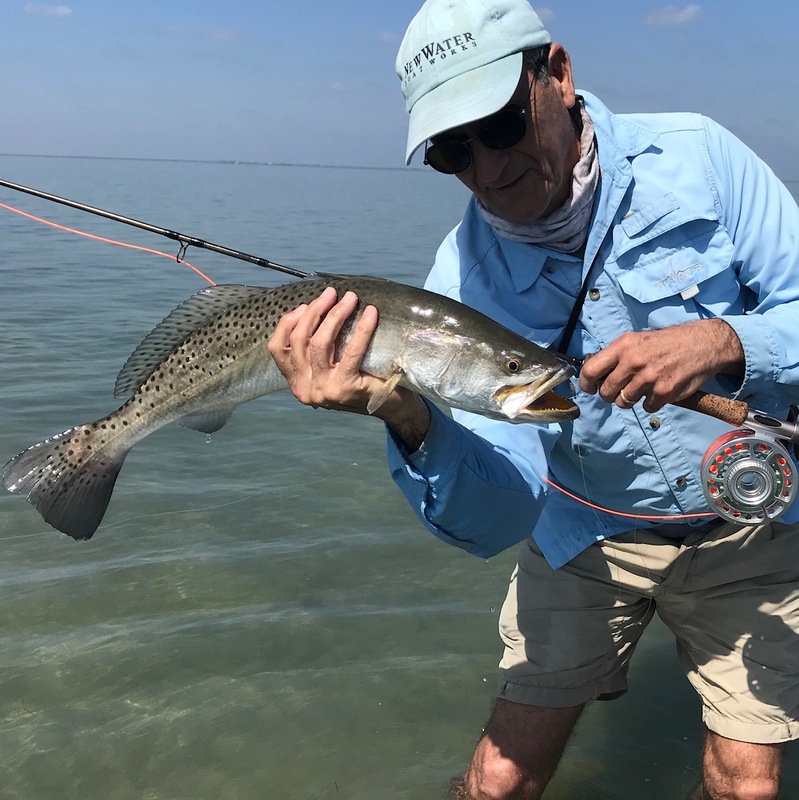 Before I could get to the place with the birds were working, I saw a single huge redfish working toward me up the shoreline with his back out of the water, zigging and zagging as the baitfish flared in his path. I was getting ready to make a cast in a very difficult scenario, in which there was about an 80% chance that the fish would spook when the fly hit the water, when I saw a single bird working upwind to my left about 50 yards. 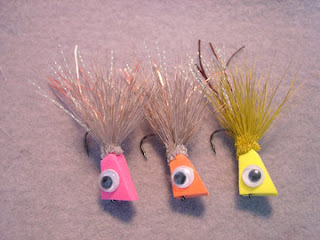 I could see some dark tails coming out of the muddy water moving upwind, so I decided to make a cast to those fish before heading back to stalk the big red on the shoreline. I fully expected the group of fish to be smaller, but perhaps more eager, so I made a long backhand crosswind cast just to the head of the group--a cast that I couldn't have made 10 years ago. I hooked up on a red that shot away so fast that I almost lost my grip on my rod. 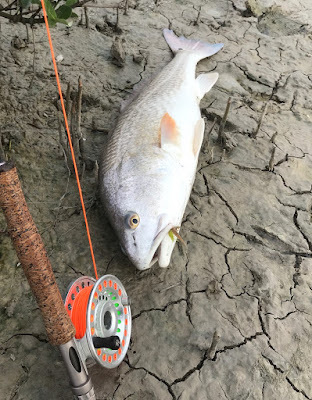 The powerful fish turned out to be a 30-inch redfish that almost spooled me before I finally turned him. It was a long fight, and after landing him I took a couple pictures of the fish on the shoreline before releasing him. 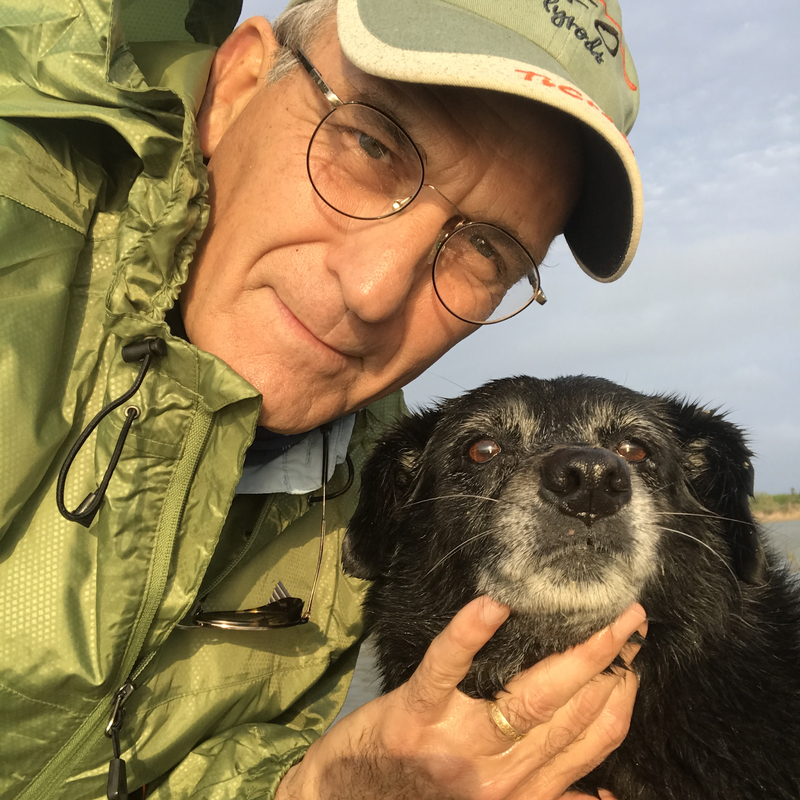 Satisfied with my success, I walked back to the boat with Rosie and prepared to leave for home, when I noticed that the west side of the lagoon was festooned with laughing gulls dipping to the water and clearly working over fish in water that was no deeper than six inches. In the past, I have encountered this scenario on many occasions, in which a large cohort of oversize redfish come into this particular area at dusk, and leave before morning. Almost no one knows about this phenomenon. 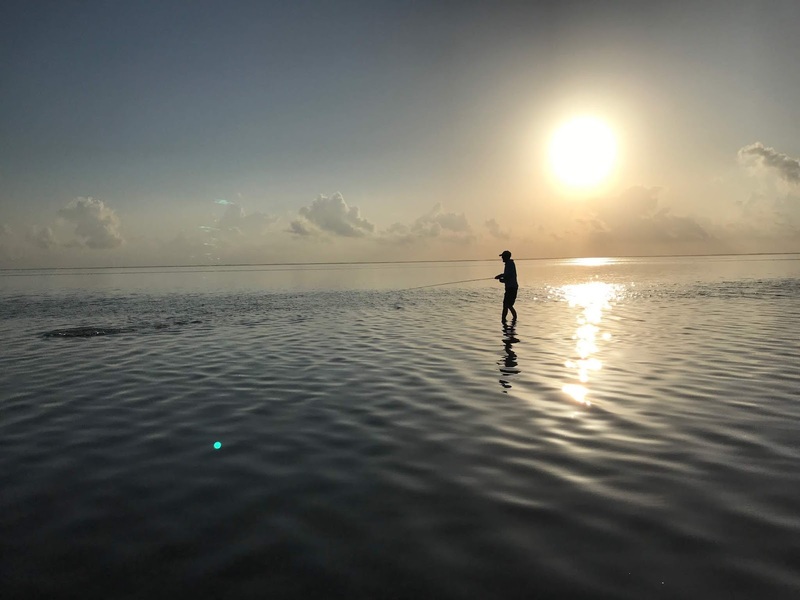 I have a friend who fishes just a few hundred yards from the mouth of this lagoon and catches oversize reds regularly in deep water on bait and Gulps. We’ve often wondered where the fish went to feed, but I think I know now, because on many occasions, I found groups of 27-32 inch reds cruising into this area right before sundown (see earlier posts). Anyway, Rosie and I took the boat over close to where the fish were feeding, and watched the birds and crashing fish for a while before deciding that I didn’t need to catch another oversize redfish to be happy. So Rosie and I headed home and got back to the dock well before the sunset. Once again, no one was there with us to see the action, and it’s pretty hard to believe it when you hear me tell the story. But I assure you, it’s one of the most durable phenomena on the bay at this time, and is the very best action I’ve encountered in years. I went back the next morning with my brother and son, and the reds were completely gone. 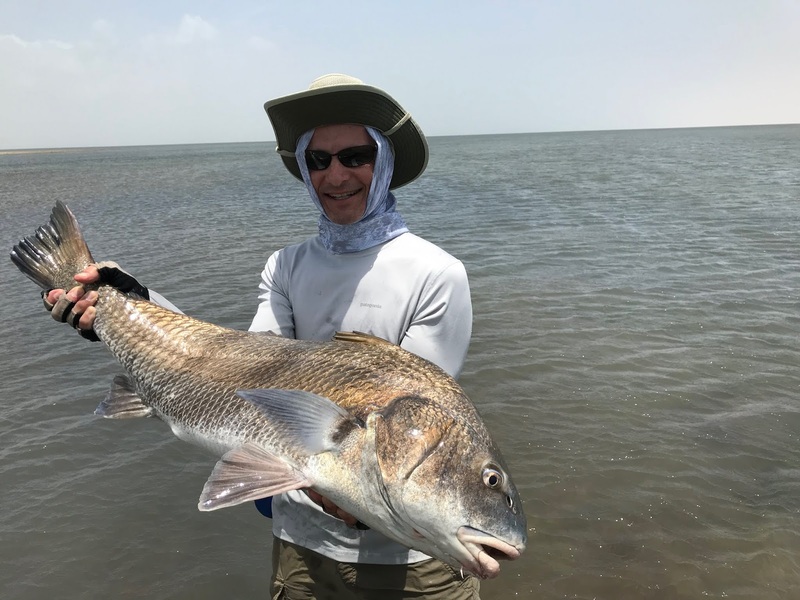 So unless you go late in the day, you would never know that the area is regularly populated with oversized redfish just 12 hours before the usual "best time," that is, at daybreak. Fortunately not many guys stay out late in the day, and there’s not many people can access such shallow water without a $50,000 boat. So I don’t mind telling you about this. If you’ve got what it takes, please feel free to join me! That is, if you know exactly where I’m going. Close won't do it. Julie and I headed for the bay on Friday afternoon with our friends Alex and Bethany following behind us. Our goal was to be on the sand by 5:30, enjoying wine and cheese as the sun made its way home. We launched the Stilt, gathered Rosie's requisite treats, and headed east about 10 miles. Two men were hanging out at the launch grousing about the Easter holiday boat traffic, but they rarely go out, and they never go to where we go, where virtually no other boats can go. By the time we arrived at the eastmost Leaning Towers spoil banks, about 2 miles from the Padre Island dunes glowing golden to the east, there were no boats within site. No buildings, no people, either, except us. It was, in today's world, a rare experience. Nothing except dunes to the east, and the sliver of the western shoreline beneath the setting sun. Rosie and I went wading for a few minutes, and located a couple of reds that were feeding in about six inches of water, with backs breaking the surface. My unpracticed cast was less than perfect, and the reds fled to deeper water. I didn't care, because catching fish wasn't my goal. 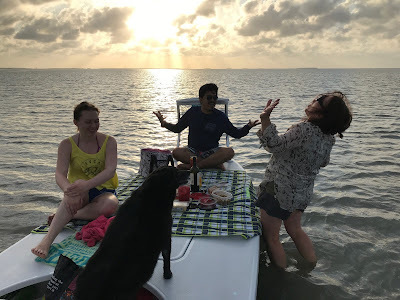 I headed back to the boat and joined our guests, who were eating all kinds of delectable finger foods on the front deck of the Stilt, and sipping drinks in the low, dramatic sunlight. We headed in before the sun actually set, and tugged on Swisher Sweets and Cuban cigars for a while before Alex and Bethany headed back to Reynosa, where Alex works as an orthodontist. The next morning Julie, Rosie and I left the dock before sunrise. For all of the times Julie and I had been out on the bay together, we'd never gone out at daybreak together. We headed for a place I often go at daybreak to see if the reds are gathered and tailing beneath gulls and terns. The breeze was low enough to see tails if the fish were inclined to pod up. We ran into the shallowest areas of the lagoon, and shut down when I saw gulls and terns diving and hovering above the water ahead of us. Then I realized that not only had I left the push pole back at the trailer (on purpose), I'd forgotten my booties, as well (not on purpose). So my goals were necessarily limited due to my casual preparation. A week before, I'd been similarly non vigilant, and had forgotten to bring extra gas for the boat. These are early spring phenomena; that is, I often mess up before I get my equipment in place, and my honed-in guide mentality up and running. But I wasn't going to be deterred from casting to the giant red that I immediately spotted heading our way, about 200 yards north of us. I had just enough time to remove my rod from the holder, slip into the water, and wade through the yucky mud far enough from the boat not to catch the poling platform or Julie with my back cast. Armed with a size 8 Clouser, I thought, "What are the chances the red will perceive this fly in this off-colored water?" Then again, I recalled many occasions when I'd been in the same lagoon on windy days, when fast-cruising reds would perceive the fly when it was fully five feet away in rough water. Sure enough, when the wake approached, and I put the tiny fly about three feet to the front of the red, it shot forward and took the fly. Since my line was slack, and the red was barreling down on me, I couldn't get a good hookup. Finally I got tight to the fly, and the red--probably 30 inches in length--porpoised in the 8-inch water, and showed me most of his huge body before plowing by me and throwing the fly. I don't need much more than that to be happy, so I stood in one spot for a while and made a few casts at nervous water before wading back to the boat. We spent a while watching the birds working over the feeding reds, and then headed east for a boat ride. Julie was so happy to see the Laguna Madre at dawn, and wants to go out with me before sunrise more often. That was the biggest "catch" of the day. I know you want something more than casual fishing stories. More serious tales will soon follow, because I can assure you that the Laguna Madre is going to fish very well this year. All of the signs are in place: low algae on the west side, a comparatively cold and wet winter, and several "turned on" days on the east side already documented by the usual suspects. You should consider coming down.